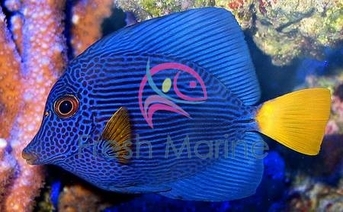 https://sep.yimg.com/ay/yhst-33477391359232/purple-tang-zebrasoma-xanthurus-yellowtail-purple-sailfin-tang-9.jpgPurple Tang - Zebrasoma xanthurus - Yellowtail - Purple Sailfin Tang ModerateAggressive100 Gallon9.8 inchesYesHerbivore, Greens, Pellet, FlakeRed SeaAcanthuridaeSmall 1" - 2"
The Purple Tang, also known as the Yellowtail Sailfin Tang, Yellowtail Surgeonfish, and the Blue Surgeonfish, is blue to purple in color with a yellow tail and yellow accents on the pectoral fins. This fish was formally known only to the coral reefs of the Red Sea, but it is now found in the Arabian Sea, the Gulf of Aden and in the waters off Sri Lanka as well. The Purple Tang usually lives singly, but can occasionally be found in schools in the southern Red Sea. Purple Tangs inhabit rocky and coral-rich reef areas where they forage and can duck under cover for sleep and safety. They are very fast and agile, often seen darting in and out of coral holes and crevices, tending to remain close to the reef, and rarely straying into open water areas. The Purple Tang is one of the most prized specimens of all saltwater fish. If housed properly, it is a rewarding and attractive addition to any large fish-only tank. They are also among the most expensive fish in the home aquarium. Be sure to provide good lighting, lots of free swimming space and plenty of potential hiding spots for the Purple Tang. They can be very aggressive and do not fare well with tank mates of similar body shape, especially other Tangs of the genus Zebrasoma. Maximum size: The Purple Tang grows upto 10 inches. General size: This fish generally comes in size of 2 to 6 inches. Minimum Tank Size: A 30 gallons or larger aquarium provides good environment for Purple Tang. Feeding and Diet: The Purple Tang will graze on algae in the aquarium as well as accepting other prepared foods both frozen and dried. Purple Tangs need vitamin supplements that are high in beta-carotene, to help prevent lateral line disease.